On the Community Council website page introducing the Co-op scheme has been visited 1,864 times by 1,606 different visitors. 2,570 people reached and 3,809 engaged. The post was shared 3 times including to the Penyffordd Streetlife Page. On Streetlife, the post received 3 ‘loves’ and '60 ‘likes’. There were a further 69 comments. We also shared the post via the @lovepenyffordd Instagram account generating 40 ‘likes’ and 21 comments and on the @lovepenyffordd Twitter account, generating 4 comments and 3 ‘likes’. I attended the meeting with the Co-op representatives (the developer) and also the meeting with the Community Council where the proposal was discussed, I have read all the comments and debate, which is very informative and considered. All of the feedback will be shared with the Co-op and Flintshire planners. I thought it might be helpful to answer some of the key questions and opinions that have come our of the debate. Open declaration - I am trying to explain what’s happening in a balanced way, but on balance I personally support the plan (with the caveat that I think some work will need to be done on traffic management). Do we need another shop? When we opposed the various housing developments in our community, including Redrow, we argued that our facilities could not cope with more people - remember the sign 4,000 residents, 1 shop? We will have nearer to 5,000 residents in 5 years time. That is around the size of settlement that retailers such as Aldi would consider viable and usually when there is already retailers there. The Spar and Co-op can survive side by side. That doesn’t mean an open door for more development, it is merely bringing facilities in line with the needs of the community today and in the near future. It has been commented that we need better buses. We do and we must stop any further erosion of our services. If you don’t drive, living in Penyffordd can feel quite isolated. The trains are unreliable, the bus services very limited and the addition of more retail choice will make a big difference to people’s lives - particularly the elderly. It’s in the wrong place. If I wanted to put a shop in a village, I would probably put it in the middle of the village or off the bypass. This location is in the heart of the village. Next to a pub, the playground, the chemist, the Community Centre (Youth Club), Scout hut, vet, butchers etc and in easy walking distance for many people. From a social perspective this is a good location. From the point of view of the Millstone garden it will undoubtedly make the view less appealing. It will be a loss of green space in the village, but it is not public space, it is up to the landowner what they do with it (within planning constraints). It would be better on the Penyffordd school site. In our Place Plan we identified the land on the school site, once it has moved, as a potential location for a shop, to relieve traffic congestion around the Spar. It was a long term goal and we expected to have to lobby Flintshire CC and retailers to try and make it happen. The Co-op tell us they have been monitoring sites around our community and are keen to build here. The Millstone site is available now - this shop could be open by the end of the summer 2019. The school site will remain operational until the summer. It is expected that the new school will be on time and will open in Autumn 2019 but that is not guaranteed. We have to wait for Flintshire Education to declare the old school surplus to requirements before it goes into Flintshire ‘stock’ and then we are meaningfully agree what happens next with it. The discussions we have had so far with Colin Everett, Flintshire Chief Exec, are that the community want to take over the land as open space - a park suitable for the Carnival and other public events, as well as public open space throughout the year. If the Co-op wanted to build on that land, the earliest realistically they could think of opening would be 2022 (that’s a best guess) and there are many questions and hurdles. Someone did ask why the Community Council can’t buy the Millstone land to retain it as green space - the Community doesn’t have that kind of money unfortunately. Comments were also made about Redrow having visited the school site. We understand that this was to discuss drainage, which was referenced in the Redrow plan. We have been assured by Flintshire County Council that there are no plans in place for the site. The Millstone is a business. They own the land (as I understand it). It is barely used currently and clearly has a value for development. Houses have been considered. The current situation is that you have a landowner with a plot of land and a buyer prepared to buy the land. The buyer has had conversations with the planning department and highways in advance because they don’t want to waste time if there is no hope of success. The Millstone are making a judgement - they will extend their beer garden to the rear to make up for the lost space and they hope that having a more active village centre will bring them more business. Ironically the most frequent complaint about the location is the impact on the drinking experience in the Millstone beer garden. That’s something the Millstone will have to consider. Can it be built up the Vounog or off the bypass? If someone knows of land that is available to sell and is in a better location, then let any of the Community Councillors know and we can pass it onto Co-op to consider. Will the traffic will make it too dangerous? The Co-op will have to submit a traffic assessment as part of their application. Flintshire highways will be consulted and their view could stop it. From a community point of view there are very real concerns about the proximity of the Hawarden Road / Chester Road junction, which is not great already, the entrance to the Millstone, the access to the park and the entrance to the Scout Hut. Since the removal of traffic calming up the Vounog, that has become a racetrack again and so something will need to be done. The location should make walking more possible for many residents. The greater concern is people diverting through the village to drop into the Co-op on their way home to Pontblyddyn, Treuddyn, Hope and so on, therefore increasing through traffic. We will be seeking a meeting with Highways to discuss the existing problems, as well as how the Co-op fits into it. Double yellow lines outside the Spar? Highways have reviewing the parking situation outside the Spar and have recommended double yellow lines. The affected residents have been consulted and it is now with our County Councillors, Cindy Hinds and David Williams to make a final recommendation. In addition to the park, there is a school bus stop nearby. The vehicle entrance is as far from the playground entrance as it can be and the shop is set back from the pavement to improve visibility. Traffic will have to take the pedestrian movements into account when considering the plans, but whilst it is a new shop for us, this sort of scheme is very common. The Ewloe Co-op is opposite a children’s nursery for example. We need to get more understanding from Co-op about deliveries (frequency, vehicles, management and time of day) and ensure with Highways that traffic is slowed in that part of the village. It will be a hub for anti-social behaviour. Observations have been made that the car park will be out of sight and could become a hub for anti-social behaviour. It will be Co-op land and it is up to them to manage their own site including how it is lit, CCTV or security measures. I have tried to explain the facts and background to the key points raised so far. All of your comments are welcome and will be passed on. We are planning to hold a public meeting to update on this and other village activities in the new year, we will invite the Co-op to attend. 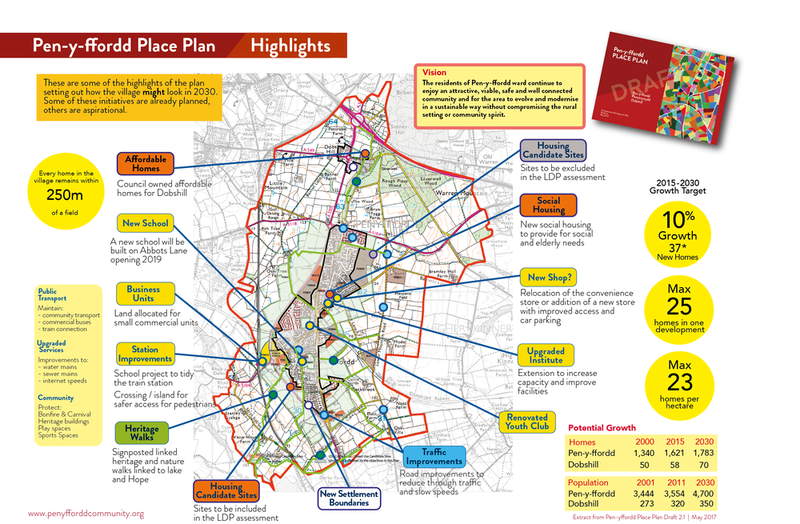 The first draft of our Penyffordd Place Plan published in Spring 2017 will be updated in Spring 2019.